Boxes containing World of Warcraft: Mists of Pandaria are making their way out into the world. 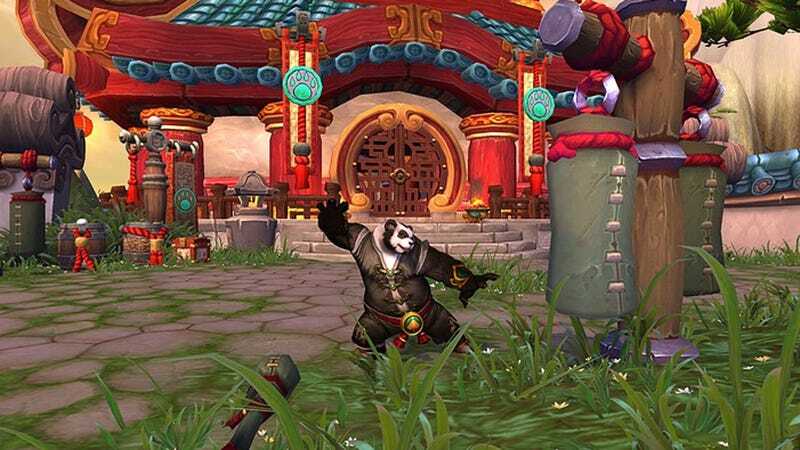 That's all well and good, but the panda-themed expansion won't be accessible until 12:01 a.m. Pacific time on Tuesday September 25, no matter how soon players install it. What can players expect, though, if they're live, sitting in Azeroth, at midnight (or, from the East coast perspective, 3 a.m.) when Blizzard throws the server switch? Players who have fully patched and registered their codes will have instant access to the new content at that time, Blizzard has clarified on their forum. And what will that access entail? A yellow System Message will appear in your Chat Log telling you to visit Orgrimmar or Stormwind to start your travels. Level-85 characters will receive a new quest, no matter where they are in the world, which will guide them to Varian or Garrosh for further orders. If you're online at midnight you will receive the quest even if your Quest Log is full — or you can visit Varian or Garrosh to get started on your journey to Pandaria. Level-85 players will notice their experience bar automatically change so that experience can once again be earned. Players who are at the Character Creation screen at midnight will notice the button to create a monk character will be enabled. It's great news for dedicated players that access will be live and instantaneous. Just remember, though: there's nothing on that list about Blizzard explaining to your boss why you keep falling asleep at work the next day.